Opera 45 is here and continues the bigger UI revamp that was started in the previous version. Today’s update includes an updated user interface with an improved download manager, a new private search function and more customization possibilities for the users. We are well aware that downloading files from the web is one of the more important features in a web browser. In Opera 45, we have fixed a lot of issues, improved the speed and reliability and also added some useful features to make downloading files easier. Sharing is more accessible via the context menu on each download item. Now it’s also very easy to delete downloaded files from your phone or remove them from your list of downloads with a quick swipe. By swiping to the right side you will delete the downloaded files from your device, while by swiping to the left side you will quickly remove the item from the download list but keep the file. If you have a download running but need to open another application, Opera will be sure to finish the job and download the file. If Opera is placed (or even killed off by your device) as a background application, the download will continue and finish while you use other applications. Opera 45 offers a new entry point when it comes to searches, both through the browser and your other applications. For example, if you are reading the news and there is a word or a phrase related to a topic of your interest but you don’t want to keep that search in your history, simply select the word and run a private search. The search will be opened in a new private tab. This functionality allows you to access the information you want without leaving a trace in your browser. 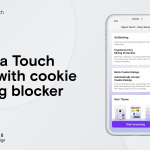 Additionally, if you read something interesting from another application, you can highlight the text from there and open a private search in Opera. This feature is active after you have installed Opera 45 on your device supported on Android 6.0 (Marshmallow) and above. We know it adds value to make it possible for you to configure your browser. In Opera 45, you can now choose what UI language to use. This was earlier bound to the language set on the device. We have also gotten many comments about the size of the Speed Dials in Opera 44, especially on larger phones and tablets. We listened, and we have adapted. Opera 45 will try to pick the best size of icons for your Speed Dial, but it will also give you the chance to choose the size yourself. If you are using Opera 45 on a tablet or phablet, you might want to adjust the size of the icons. You can choose between small and large in settings. As another reminder from the aspect of customization, you can also decide if you want to run the interface in phone or tablet mode. 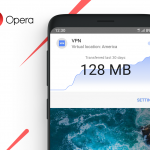 Opera 45 is currently rolling out in Google Play, so if you haven’t already gotten an update, you will soon see it on your device. Happy browsing!